From inspiration till completion. First class references. Personalized DM (direct marketing) prints may be used to reach the target group with news or with questions expecting a reply. Due to its directness the subject hits the target on a large scale, meanwhile the addressing of those who are uninterested or unauthorized in the topic will be excluded. 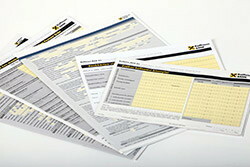 The application of DM prints assumes the availability of database(s). Rely on the printed information! In March 2013 VTT a Finnish research institute (VTT, Technical Research Centre of Finland) published the following survey results, in which more than 700 citizens of 13 European countries were questioned. The results are obvious. 25% rely on online promotions. 90% regard personalized or unpersonalized printed advertisings more trustworthy than public media. Nine out of ten prefers to review a catalogue instead of an online promotion. DM is a costeffective solution because it is produced in the right quantity, enough for the target group. Printing of variable datas, personalization: QR codes, barcodes, numeric and/or abecedarian codes, serial numbers, dates, addresses. In various cases the personalized print must be joined with another printed product, or it has to be glued onto something (e.g. coupon, gift cards). The advantage of our extremely precise, automatic inserting machine is that we are able to fulfill these requests within a short time. The graphic studio is an important division of the printing house, where skilled and imaginative designers create the designs and help to find the appropriate material. Generation of QR and barcodes either singly or from databases – e.g. addressing, numbers, balances, codes, texts -, and the integration of these into the artwork, is an important part of the work at our DTP department. Sufficient bandwidth enables the fast and safe data transfer. We always strive to provide useful proposals, and to deliver unquestionable quality prints. A sample (proof or online forwarded pdf and database) is always available for our customers, even if the design was created externally. The exceptionally well trained staff, comprehensive production experiences, client customized quality assurance system, full commitment to our clients, flexibility and state-of-the-art equipments guarantee that the products produced by us always reflect premium quality, and are supplied on time. Our leading-edge machines are relatively new (Heidelberg, Herzog & Heymann, Kern, Kohmann, Xerox). The advanced and in-house technology, supreme production planning and quality assurance system contribute a remarkable competitive edge to our customers. Copyright © 2015-2019 KOMPRESS Kft. - a printing & packaging house, All rights reserved!